Come and make PEACE with your ancestors, heal old relationships, make peace with the ones that left before us, reprogram your DNA. Forget, forgive, let go. Let us build the most beautiful altar, flower mandala, do an ancient Mayan CACAO ceremony. DREAM SEED is coming - a shamanic sound healing meditation. Bring wholesome sweet, organic, gluten-free candies and cakes, bring pictures of your loved ones, flowers. Dress well for the occasion - Halloween style and more. WOW, Spookawesome. Cost: $40. Online registration is full; based on the capacity of the space, a certain number of people will be allowed in at the door on the day of the event. Maestro Manuel Rufino is a recognized elder in the Taino tradition and World Director of M.A.I.S.C., a recognized 501(c)3 nonprofit organization dedicated to sharing the teachings of humanity's great wisdom traditions. He is a spiritual guide, gifted ceremonial leader, and teacher of sacred initiatic traditions of the world. He is also an artist, certified iridologist, naturotherapist, vegetarian chef & the visionary guiding Golden Drum, and many vegetarian restaurants including Jungle Café. 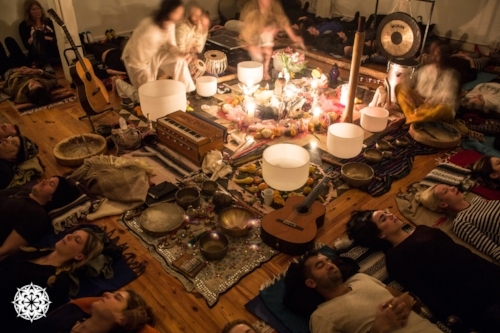 Members of Dream Seed are active organizers of the Golden Drum and the Sacred Arts Research Foundation communities. They are students of Maestro Manuel Rufino. With his blessing, Dream Seed was created as a vehicle with which to share the music of sacred traditions of the world.